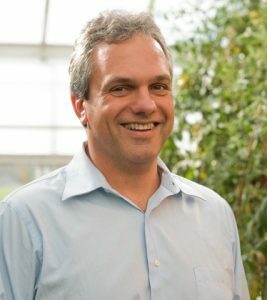 James (Jim) Giovannoni, Boyce Thompson Institute professor, USDA-ARS research molecular biologist and adjunct faculty in the SIPS Plant Biology Section in Cornell-CALS, has been appointed as the Director of the USDA-ARS Robert W. Holley Center for Agriculture and Health (RHCAH) in Ithaca, New York, effective April 15, 2018. For the last two years, Dr. Giovannoni served as the Acting Director of the RHCAH. Dr. Giovannoni is a California native and received his Bachelor’s degree in Biochemistry at the University of California, Davis (1985) and a Ph.D. in Molecular and Physiological Plant Biology at the University of California, Berkeley (1990). He undertook postdoctoral research with Dr. Steven Tanksley at Cornell University (1990-19992) and joined the faculty of the Department of Horticultural Sciences at Texas A&M University (1992 – 2000). Jim joined ARS as a Research Molecular Biologist in the Plant Soil and Nutrition Research Unit of the RHCAH in Ithaca, NY in 2000. His laboratory is located in the Boyce Thompson Institute for Plant Research on the Cornell University campus. Dr. Giovannoni is a world-renowned scientist, a member of the National Academy of Sciences, and was included in the 2015 Thompson Reuters’s list of “the World Most Influential Scientific Minds.” Dr. Giovannoni’s landmark and seminal discoveries and contributions to our understanding of fruit ripening of Solanaceous and other fruit crops have led to important germplasm improvements in public and private breeding programs. His research focuses on the regulation of fleshy fruit ripening and related nutritional pathways. His activities are centered on understanding early events in the regulation of the ripening transition using tomato as a model and exploring the conservation of ripening mechanisms in additional fruit species. Jim led the US component of the international effort to sequence the tomato genome; his group identified the first transcription factor regulating ripening and his lab is currently exploring the role of the epigenome in fruit development. He and his team have an extensive publication record including papers in Science, Nature, Nature Genetics, Nature Biotechnology and the Proceedings of the National Academy of Sciences. Jim was honored as USDA-ARS, North Atlantic Area Senior Research Scientist of the Year in 2010 and 2017, elected as a Fellow to the American Association for the Advancement of Science (AAAS) in 2013, received the US Secretary of Agriculture Honor Award for Exceptional Service as leader of the US tomato genome and fruit biology team in 2014, and was awarded the USDA-ARS, T.W. Edminster Research Associate Award in 2015.